St. Scholastica is in the midst of implementing a $1.4 million, two-year grant from the Health Resources and Services Administration (HRSA) to fund the Rural Academic Practice Partnership (RAPP) for Northeastern Minnesota. This is one of 50 grants HRSA planned to award in the nation through the Advanced Nursing Education Workforce initiative. "The School of Nursing at St. Scholastica is honored to receive this highly competitive national grant," said Dean Julie Anderson of the School of Nursing at St. Scholastica. "RAPP is the culmination of ongoing collaboration between St. Scholastica and Essentia Health and will improve the region's health and well-being. Meeting the healthcare needs in rural and under-served areas requires innovative responses. That is what the RAPP initiative epitomizes and it is an excellent fit with our mission," said Dr. Colette Geary, President of The College of St. Scholastica. The RAPP initiative aims to improve access to care, quality of care, and ultimately health outcomes for people living in rural communities of northern and central Minnesota through enhanced placement of nurse practitioner students in rural settings and expanded educational opportunities for rural primary care providers. St. Scholastica and Essentia Health are collaborating to recruit preceptors and deliver professional development, expand student engagement in rural clinical experiences, and incorporate training around relevant topics such as rural health needs, health disparities, diversity, and cultural competence. Essentia Health CEO Dr. David Herman said, "Essentia Health is proud to partner with The College of St. Scholastica on this important initiative. Access to healthcare in rural America is dependent upon having great individuals who are engaged and understand the complexities of health in rural areas. This initiative will facilitate our organizations in building that engagement and understanding among our future professionals." Essentia Health is an integrated health system network of physicians, healthcare providers, hospitals and clinics, with more than 1,900 physicians and advanced practitioners. It serves 38 rural communities in a region characterized by geographic isolation - some with issues of poverty and major health disparities between different ethnic and racial groups. 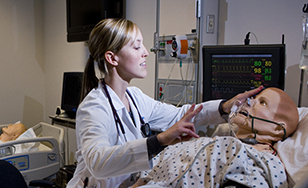 The College of St. Scholastica has the second-largest nursing program in Minnesota, with just over 1,000 students. Its Doctor of Nursing Practice (DNP) program is a terminal degree in nursing practice that prepares nurses for advanced practice within the context of both clinical and systems roles. Students develop complex leadership skills within organizational and systems levels of practice.